Although spring flowers are nowhere in sight from adorning Michigan Avenue, your garden, or balcony flower boxes, it’s truly time to start thinking spring. And, that means out with the old and in with the new; and glow your way to summer. All the rage right now is decluttering where if something doesn’t make you happy throw it away. My concern isn’t “happiness” so much as “age!” Just when did you buy those cosmetics or skin care products? Even if they are your most favorite and you just love them and using them makes you oh so happy, if they are a year old, throw them out!! Like most people, your older products have been exposed to the elements—air, pollutants, germs—and are no longer your best friend. Get new ones and your skin will thank you. Putting on old makeup is bad for your skin. Now is the time to throw away your old makeup and buy anew. While you’re doing that, update to lighter, brighter spring colors. It’s almost time to switch your moisturizers. If you started using a heavier one for our cold, drier winter months, start looking for a lighter one. And, as we approach summer, you may want to switch again to an even lighter one. I tell you this all the time, and I’ll say it again: always look for a moisturizer with built-in SPF for sun protection. Your medications have expiration dates. If you have old medications and they are past their expiration dates—whether over-the-counter or prescription— throw them out! Your skin needs spring renewal, too. This is a great time to slough away all that dead skin to reveal the soft, glowing skin underneath. For your face, it’s the perfect time to schedule a microdermabrasion with us! And, for the ultimate in spring hydration for your face, nothing is better than a Hydrafacial!! I can’t say this enough. No matter if it’s a bright, sunny day, cloudy, or even raining, every morning, apply sunscreen to every area that could be exposed to the sun. And, of course, use a broad-spectrum UVA/UVB sunscreen of at least SPF 30. And, while you’re spring cleaning, check the expiration date of your sunscreen. If it’s expired, get a new bottle. This goes for moisturizers, lip balms and any other products you use that have SPF in them. Just because you saw it on social media, doesn’t make it right for you. 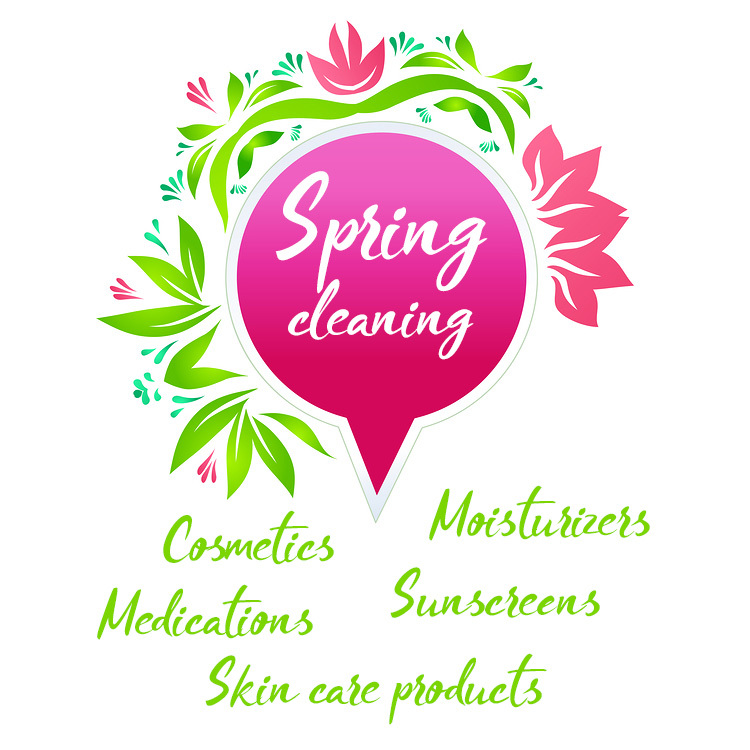 Instead, look at spring as your opportunity to talk with us about setting up a skin care plan. We’ll help you schedule regular treatments, suggest appropriate products for your particular skin type and needs, and help keep you looking your very best.